Eralia E. Nye passed away December 8, 2017 in Hastings. Eralia was born September 30, 1929 in Lucero, New Mexico; the daughter of Pedro and Maria Montoya. 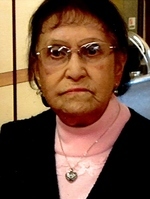 Eralia attended the University of New Mexico and the University of Colorado. A Licensed Practical Nurse at Leila Post Hospital, she also was a private duty nurse for many years. She enjoyed gardening and most of all she loved her family. On January 7, 1953, Eralia married the love of her life: Kenneth Nye and he preceded her in death on February 25, 2010. She is survived by daughters: Deborah Waite, and Linda Gardner, sons: Thomas (Cheryl) Nye, Bradley (Peggy) Nye, and Tim (Laura) Nye, a sister: Arabella Montoya, ten grandchildren, ten great grandchildren and several nieces and nephews. Eralia was also preceded in death by her parents and brothers: Ferenando, Laudente, Dennis, Lee and Armando Montoya. Her family will receive friends, Friday, December 15, 2017, 10:00 to 11:00 AM at the Williams-Gores Funeral Home, Delton where her memorial service will be conducted at 11:00 AM, Pastor Jeff Worden, officiating. Burial will take place in Dowling Cemetery. Memorial contributions to a charity of your choice in memory of Eralia will be appreciated. Please visit www.williamsgoresfuneral.com to leave a message or to leave a condolence message for Eralia’s family.